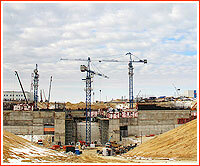 The development of the future space center in the Russian Far East was to reach a major milestone this year with the completion of the concrete structure at the launch pad for Soyuz-2 rockets, clearing the way for the installation of the launch hardware. Russian Vice Prime Minister Dmitry Rogozin said that after closing of the Olympics in Sochi, Vostochny would get highest priority among federal projects. Above: A satellite view of the Soyuz launch facility (top, right) and supporting infrastructure in Vostochny at the end of 2013. On January 10, the official RIA Novosti news agency reported that President Vladimir Putin had urged the leadership of the Russian space agency, Roskosmos, to meet deadlines for the completion of the Vostochny launch site. During his meeting with Putin, the head of the agency Oleg Ostapenko reported that construction delays at the facility had been cut to just two or two and half months, RIA Novosti reported. Six days later, TsSKB Progress, the developer of the Soyuz rocket, hosted a meeting of the Chief Designer Council to discuss preparations for the first launch from Vostochny, the company announced on its web site on January 17. Deputy Chief of the Russian space agency, Roskosmos, A. N. Ivanov chaired the meeting, which was also attended by representatives from the agency's key research institute TsNIIMash, Keldysh Research Center and by other industry leaders. Deputy Designer General at TsSKB Progress Dmitry Baranov, who is responsible for launch vehicle development, assured the council that the first mission from Vostochny scheduled in 2015 was not in doubt. 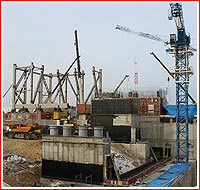 Baranov reported that the launch pad in Vostochny would host the Soyuz-2 series of rockets, including versions "a," "b," and "v."
Other contractors in the project also reported good progress and high readiness of the launch pad, processing and support infrastructure in Vostochny, TsSKB Progress announced. 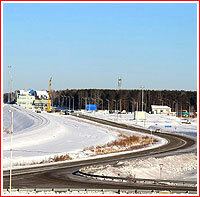 Also on January 16, Chief directorate of the Special construction, Spetsstroi, announced that its Far Eastern division completed a two-lane road, linking the federal highway Chita-Khabarovsk with the town of Uglegorsk, the main residential and transport hub of the future space center. 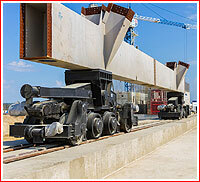 It was only the first step in the development of the transport arteries in Vostochny, the organization announced. However critics pointed out that the small spur of the road to Vostochny was much better equipped than the main highway it was connected too. 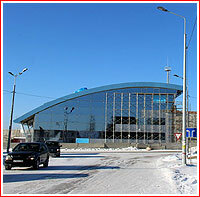 At the Ledyanaya train station, the main railway hub of the space center, upgrades included the construction of several new and extension of old sidings, which were largely completed in January. 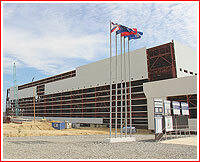 The state-of-the art bus and train terminal at the Ledyanaya station was to be completed in June. According to a report of the Amur.Info news agency, remaining 25 kilometers out of 65 kilometers of new railway were scheduled for completion in 2014. 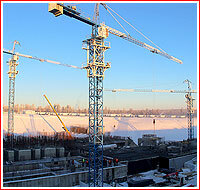 In January, Spetsstroi also reported the completion of the main administrative building of the space center in the new industrial zone of the launch facility. According to the organization, internal outfitting work was conducted also at the fire station for six vehicles, automobile park, construction material storage and at the rain water treatment facility. By the end of January, Spetsstroi promised "soon" complete 17 multi-story apartment blocks with 1,482 apartments, with top floors being in process of construction. However due to a late arrival of construction documentation in October 2013, the construction could only start in November, Spetsstroi said. 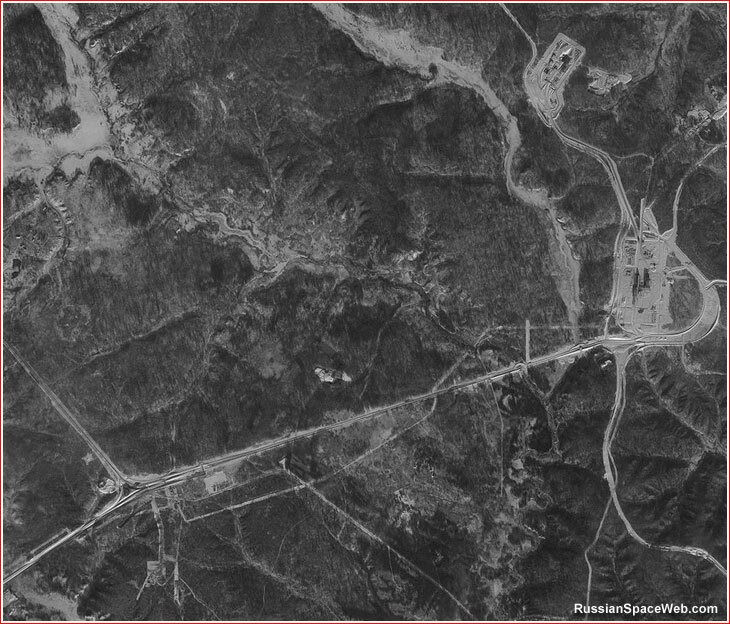 Satellite photos of the Vostochny area also showed the first signs of action at the future site of the airport, whose construction was scheduled to start in 2013 some 12 kilometers north of Uglegorsk. According to original plans the airport had to be completed in 2015, however, as of the beginning of this year, the work was apparently limited to clearing of the trees from the path of the future access road to the facility. Above: Storage facility for stages of the Soyuz rocket (foreground, center) and spacecraft processing building (background, right) around January 2014. On (Sunday!) 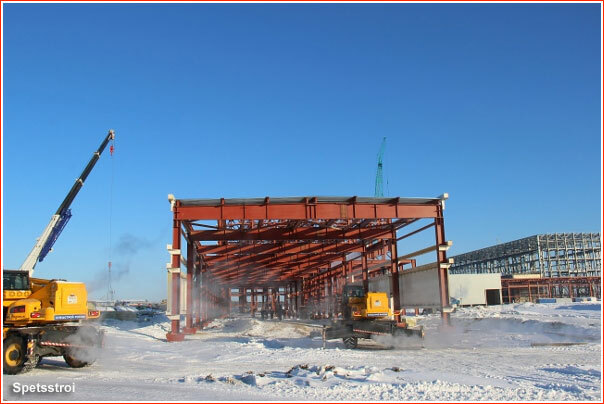 January 26, Spetsstroi announced that despite temperatures in Vostochny plunging to -40C degrees, the work was continuing on the erection of the metal framework and concrete cell walls of the processing building for the Soyuz-2 rockets. At the time, the roof of the fourth floor was being built and the metal framework of the spacecraft processing building was being assembled. Also, construction had started at the fueling and neutralization station, ZNS, for spacecraft and upper stages. Finally, sandwich panels were being installed into the walls of the storage facility for stages of the Soyuz-2 rocket, as well as on a transfer gallery connecting all buildings and on a power and cooling station, Spetsstroi said. Likely reacting to reports in the local press about appalling living conditions and low pay for ordinary workers in Vostochny, Spetsstroi claimed that special attention had been paid to the "improvement of working and living conditions." According to the agency, four comfortable makeshift towns had been deployed at the technical area, complete with canteens, medical facilities and bath houses. The agency also claimed that all personnel had been provided with winter clothing and that warming stations had been made available at all construction sites. However the agency failed to confirm that all living accommodations for workers were adequate, not just a few "Potemkin villages" built for visiting bosses from Moscow, as the local newspapers and unofficial postings on the Internet forums had previously reported. On January 31, Spetsstroi announced that the foundation of the technical facility for the measurement means complex, KSISO, would be made available for the hardware installation ahead of schedule on February 15. On August 20, Spetsstroi said that all load-bearing structures of the transborder gallery had been completed and the internal outfitting of the facility with electric and other systems had began. The main internal railway line of the facility was now available for the installation of the equipment and contractors had been manufacturing the main movable platform for the gallery. 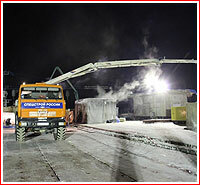 On January 28, Spetstroi announced that in the previous two days, 100 workers using 12 mobile concrete mixers and three pumps successfully poured 680 cubic meters of concrete into the fourth level of Block B of the Soyuz launch pad, reaching 13 meters below the top concrete surface of the pad, which eventually have a height of 30 meters. Special temporary support scaffolding had to be built at the site with a total height of 21 meters, which would be able to hold up to 2,000 tons of pressure. Due to winter conditions, a special heating shelter was erected around the pad structure to prevent concrete from freezing. In the following days, another 630 cubic meters of concrete was to be poured into the fourth level of Block A. Spetsstroi's press-release quoted the head of the Construction Directorate, SU, No. 713 Yevgeni Shamrov as saying that cold temperatures put heavy burden on his people and the work schedule had to include breaks, allowing workers to get warm, have tea and dry their cloth. When the head of Roskosmos Oleg Ostapenko visited Vostochny on January 30, the project managers told him that the cold weather had contributed to further delays in construction, likely making it impossible to make up for earlier delays by March 30, the Amur.Info news agency reported. 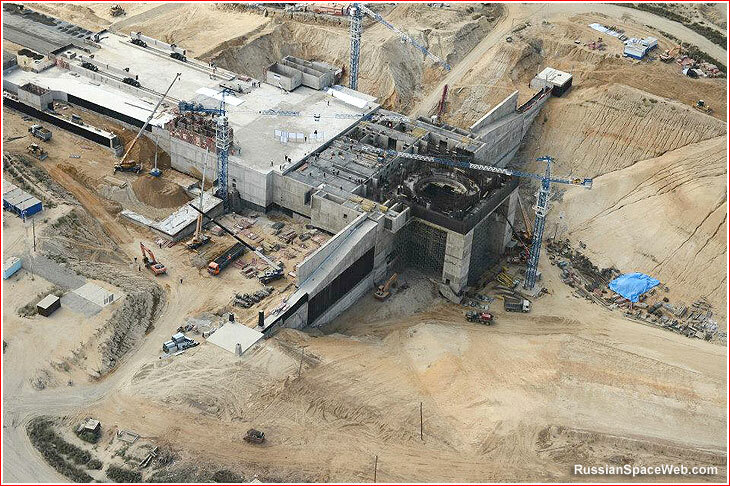 According to Director General of Vostochny cosmodrome Sergei Sklyarov, quoted by RIA Novosti news agency, the construction managers promised to complete remaining three levels of the pad by May 15. 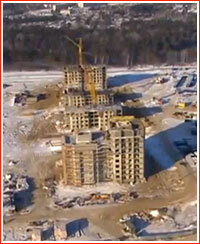 On January 31, Spetsstroi officially confirmed that -50-degree weather did cause a short delay in construction. At the same time, the organization announced that 30 out 33 structures of the launch pad were under construction. Three facilities -- the oxygen and nitrogen block, kerosene and naftil block and compressed gases block -- would be ready for the hardware installation. According to Spetsstroi, 420 people worked at the pad and by February 5, this number was expected to increase to 500 people. At the beginning of the year, a total number of workers involved in the project reached 5,500 people, including 3,725 people involved in daily construction activities and permanently stationed at construction sites. This number included 600 engineers. Nine makeshift towns with a population of 2,917 and a hostel for 1,259 people were built to accommodate construction personnel, along with a canteen for 312 people, Spetsstroi said. During a visit to Vostochny of Vice Prime Minister Dmitry Rogozin on February 24, the lack of workforce was cited again. The low quality of construction was also mentioned. Rogozin demanded to transfer workers from completed olympic facilities in Sochi, if necessary. He was quoted as saying that the number of workers should reach 15,000. However, according to a Spetsstroi representative, the workforce will reach its peak of 8,000 in the third quarter of this year. First were floods, now a colossal fire threatens the construction of the new Russian space port. Multiple sources of forest fires in the Amur Region (known in Russian as Amurskaya Oblast) were first reported on April 28 by the web site of the independent environmental organization Russian Greenpeace. 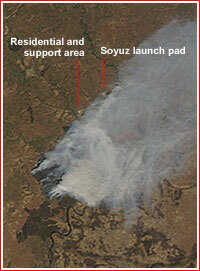 Citing satellite imagery, the report called it the biggest fire in Russia covering 109,000 hectares. No federal agency confirmed or warned about the situation at the time, the Russian Greenpeace said. On April 30, the local Zeiskie Ogni newspaper reported that the previous evening, the head of the launch site construction Konstantin Chmarov arrived to a nearby city of Svobodny and chaired an emergency teleconference with regional leaders and local representatives of the Emergency Situation Agency, MChS. 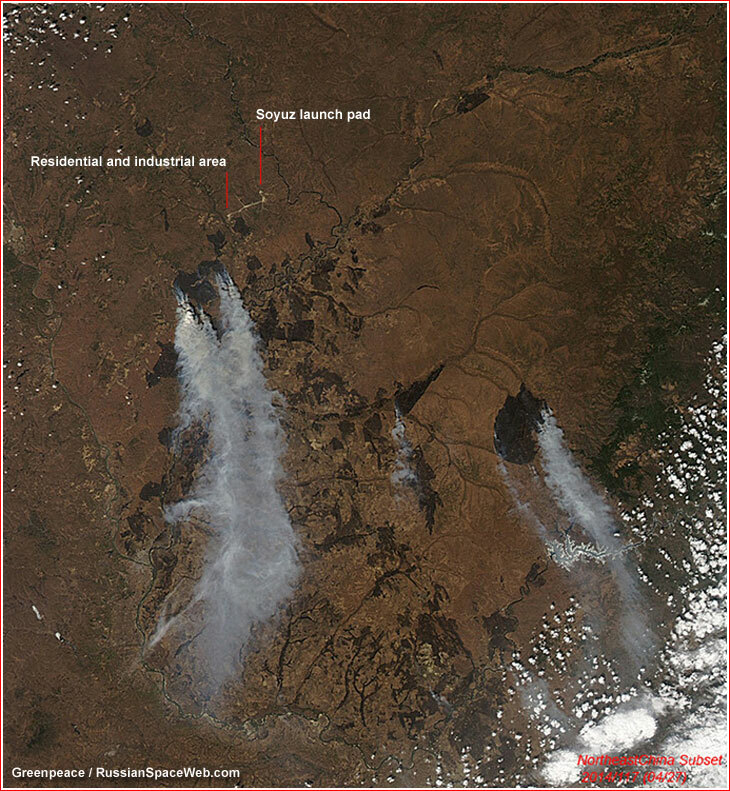 According to the publication, four big fires were raging in the Svobodny district threatening the Iversky Forest Reserve and the Vostochny launch site. At least three people were reported killed fighting the blaze, the newspaper reported. Chmarov reportedly characterized the fire-fighting effort in the region as "chaos." Fueled by hot weather and strong winds, the fire approached the airport in Svobodny and was also moving toward Vostochny. In the meantime, satellite images showed heavy smoke blanketing the future space center. On May 2, the Spetsstroi construction agency issued a press-release claiming that the work at all eight sites of the space center had continued non-stop even for weekends or a traditional May-day holiday. The agency said that warm weather had made it unnecessary the use of electric heating of fresh concrete, thus greatly increasing the pace of construction. 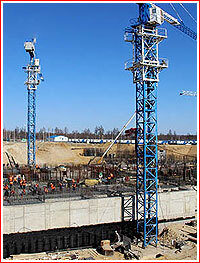 According Spetsstroi, 400 people assisted by three cranes were working in two shifts at the launch pad. 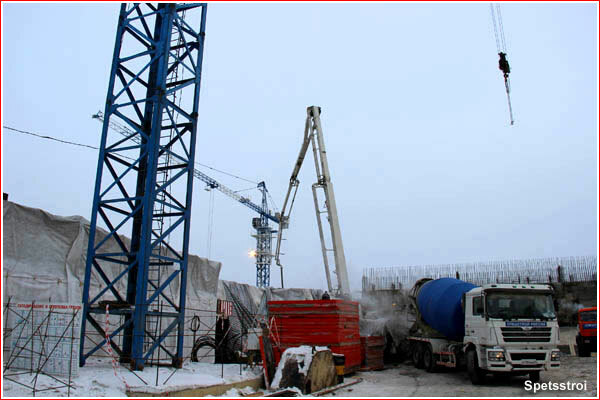 Workers were preparing 20,000 cubic tons of concrete for the extra-stable parking pad of the future mobile service tower for the Soyuz-2 rocket. At the same time, the ceiling construction on the third floor of launch pad's Block A supporting column was entering the final stage. On the parallel Block B column, workers were erecting walls of the second floor, the agency said. In the old Soviet tradition, Spetstroi made no mention of the inferno raging in the area at the time. 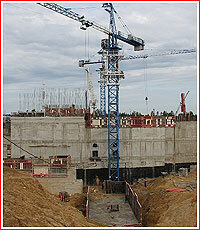 By the end of July, workers were pouring concrete near the top level of the Soyuz launch pad. In July, construction crews approached the top level of the monumental concrete structure comprising the Soyuz launch complex at the Vostochny Cosmodrome. At the end of the month, the regional government reported that Block A of the launch pad had been completed after pouring 1,700 cubic meters of concrete. At the time, construction teams were yet to top out the second level of Block B. (It was a relatively minor lag behind the previously promised May 15 deadline for this phase of the work.) The structure of the launch pad was promised to be completed on August 28. Also, official Russian TV showed the installation of giant cisterns for kerosene fuel, liquid oxygen and nitrogen gas at a nearly completed storage facility of the launch complex. The active construction of 12 residential buildings, of a kindergarten, of a boiler facility and of a water treatment plant was also continuing at the future space center. 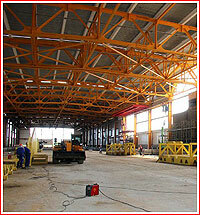 A new concrete-production plant, a power conversion station and a car park were reported approaching completion. During the summer, regular workforce was reinforced with 400 members of 22 student teams assembled at the site from 15 regions of the Russia, the local government said. The head of the Russian space agency, Roskosmos, Oleg Ostapenko visited Vostochny on July 30. Among other construction sites, Ostapenko inspected a future ground control station of the space center, Roskosmos said. Ostapenko also dropped by at one of the trailers housing construction workers. In front of an official camera, one student worker repeatedly answered "yes" to Ostapenko's queries whether life and working conditions had been good at the site. Next day, Ostapenko chaired the first meeting of the newly assembled interagency commission on the Vostochny development. Besides Roskosmos, the commission included representatives of the Emergency Ministry, MChS, Spetsstroi construction organization and Federal Medical Service, FMBA. He was quoted as saying at the opening of the meeting that the construction had been going on "under pressure" to meet the schedule set up by the president and by the Russian government. To save time, officials promised to begin outfitting some of the facilities even before the completion of their construction. Above: Roskosmos head Oleg Ostapenko (right) and the Russian president Vladimir Putin at the Soyuz launch pad in Vostochny on September 2, 2014. The Russian President Vladimir Putin re-visited Vostochny on September 2, during his trip across the country including the Russian Far East. 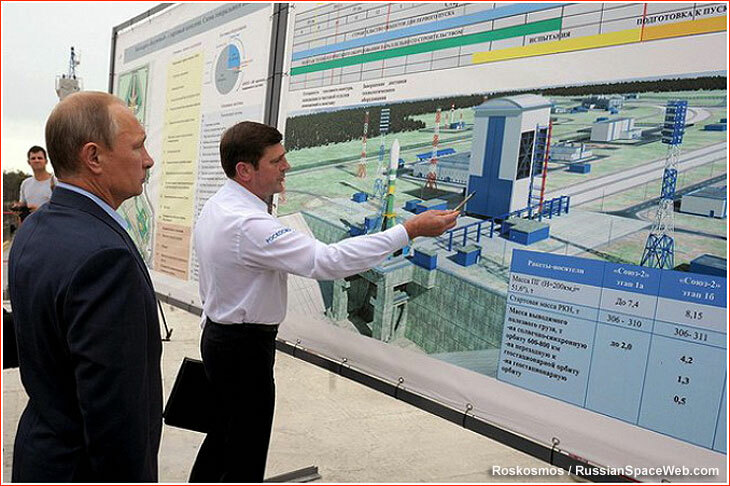 Putin toured the launch pad for Soyuz rockets and the processing area. He then chaired a meeting in Blagoveshensk on the development of the launch site. During the meeting, Putin watched a ceremony of powering up an upgraded electricity-distribution center at the local Ledyanaya train station. The facility was designed to supply electricity to the space port's main power hub, GPP. In his public introduction to the meeting, Putin again stressed the importance of completing the site by the 2015 deadline and said that the current lag in the work schedule had been between 30 and 55 days. 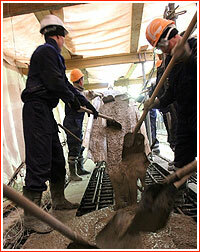 According to Putin, more than 6,000 people were working at the site, instead of needed 12-15 thousand. Putin also disclosed that 100 billion rubles had been spent on the Vostochny project since 2011 and another 50 billion had been allocated in 2015. 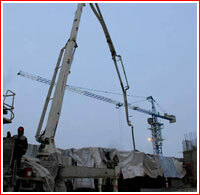 At the time of Putin's visit, Spetsstroi reported that a quarter of all the equipment had already been delivered to the launch site from 50 contractors around Russia. A total of 26 facilities were in process of being outfitted with internal hardware. In his report to Putin, the Roskosmos head Oleg Ostapenko said that a third of equipment had been delivered. However Ostapenko admitted that mobile tracking stations of the Ministry of Defense would be required to support the first launch from Vostochny, despite an ongoing construction of the stationary tracking facility. However official reports from the Kremlin, Roskosmos and Spetsstroi did not mention much more serious problems that had apparently been on the agenda of the meeting with Putin. Lack of workforce and unrealistic deadlines imposed by Moscow in the Vostochny project inevitably prompted developers to cut corners and sacrifice the quality of construction. According to the Izvestiya daily, quoting an unnamed source at Roskosmos, reports prepared for the meeting warned that the installation of equipment in unfinished facilities had put at risk the sensitive hardware. 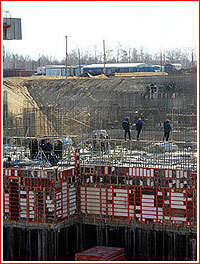 Much worse, inspections revealed poor quality of construction at the Soyuz launch pad. For example, cracks had already appeared on the ceiling of the fourth floor inside the launch structure. At the processing facility, some pillars of the crucial "transborder" gallery had been installed without necessary amortization supports. Numerous violations and poor quality of construction were also found at the new residential complex. While the official Russian media kept repeating that only Russian citizens were employed in the project, the Izvestiya revealed wide-spread exploitation of illegal immigrants from Moldova, Tajikistan and Kyrgyzstan to minimize cost of construction and maximize contractors' profits. Above: The Soyuz pad in Vostochny in August 2014. In the Kremlin's transcript of the September 2 meeting, Ostapenko said that during the first mission from Vostochny, a Soyuz-2-1v/Volga rocket would deliver the Mikhailo Lomonosov and the Aist-2 satellites. All tests of the launch vehicle were scheduled to be completed in May 2015 and it was to be shipped to the launch site in the following June. Lomonosov was to be ready by December 2014 and its delivery to the launch site was also set for June 2015. No public announcements were made about the promised launch of the manned spacecraft in 2018, however an official TV reportage likely inadvertently revealed that an unmanned Oka-T satellite would be launched as the "first mission within the manned space program" in 2018. 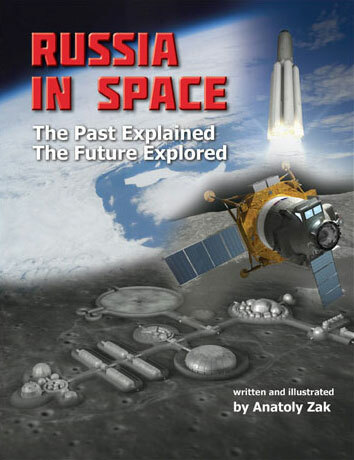 It essentially confirmed that manned missions would not be possible from Vostochny until 2020s. In the second half of November, the Vostochny project official said that concrete structure of the launch for Soyuz rockets would be topped off on December 25, or around a half a year later than previously promised. 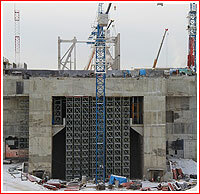 On December 1, Spetsstroi announced that its crews had been pouring final layers of concrete near the surface of the launch pad at Block A. The announcement confirmed that the concrete work would be completed by December 25. A total of 650 cubic meters of concrete and 61 tons of reinforcing cages were required for the top platform of the launch pad. The company admitted that its workers had struggled to meet tough requirements of the project in a very cold weather, which led to loss of time and additional expenses. In particular, workers spent a lot of efforts to keep concrete warm with the help of 20 dizel-powered air blowers and electric heaters. It would take from three to five days to warm up this amount of concrete to the right temperature. The announcement promised the first launch of the Soyuz from the facility in December 2015. As of November, Spetstroi reported that 35 facilities of the launch complex had been made available for outfitting with their internal hardware, even though the construction was still ongoing in most parts of the infrastructure. Additional 40 sites would be ready for hardware installation before the end of December, Spetsstroi said. By the beggining of December, the future user of the complex, TsENKI, gave Spetstroi a list of 22 facilities, which would have to be outfitted by December 12. In the meantime, on December 5, the Russian government published an order No. 2460-r from the Prime-Minister Dmitry Medvedev issued a day earlier appointing Kiril Martynyuk as a new Director General of the Vostochny Directorate, which manages the construction of the new center. The previous head of the organization Sergei Sklyarov was apparently fired. The management re-shuffle came on the heels of several corruption and mismanagement cases surrounding the project. Above: Aerial view of the Soyuz pad in Vostochny around mid-December. The main "ring" of the launch structure is now covered to provide a heated envelope during pouring of the final concrete. 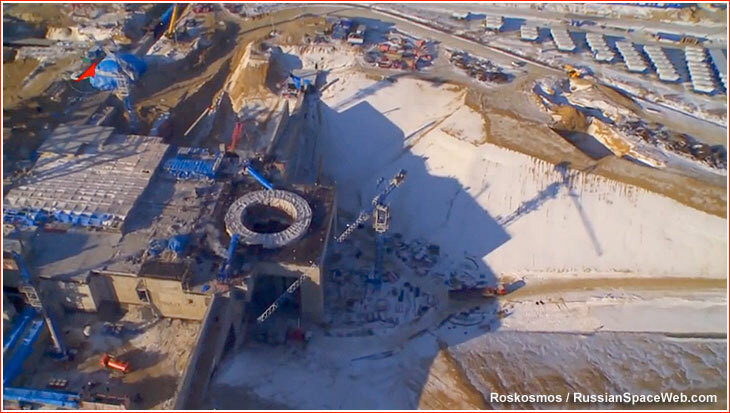 On December 23, a week before his year-end visit to Vostochny, Vice Prime Minister Dmitry Rogozin said in an interview with the Argumenty i Fakty weekly that the final concrete would be poured on December 25 into the circular structure or "firing ring" at the heart of the Soyuz pad. In the following few days, photos and videos from the site showed considerable progress in construction, but still short of completion. With no official fanfares before the end of the year, it was clear that at least some delay was inevitable. 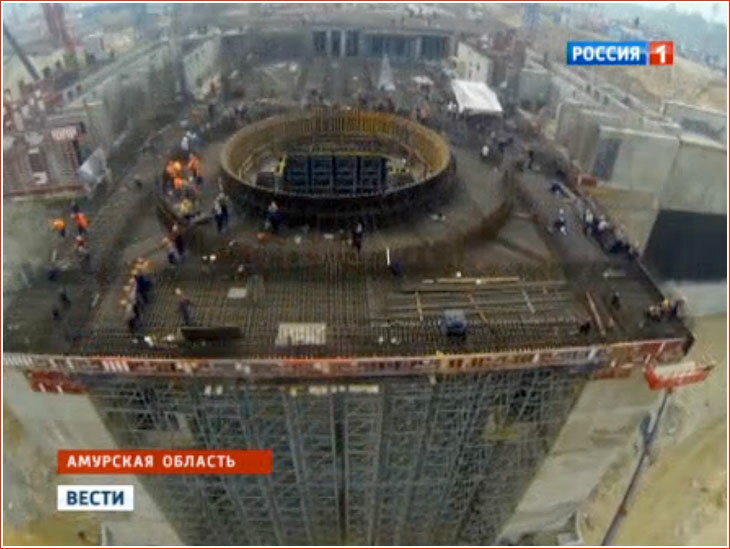 On December 31, Spetsstroi did say that the laying of the final concrete forming the "firing ring" of the pad had been initiated two days earlier and continued throughout the day. 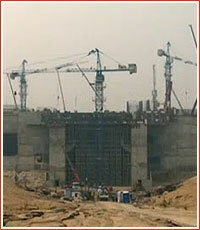 However workers were yet to finish the concrete top of the Block B on the pad, the company said. At least one worker fell to his death at the work site, according to local press. 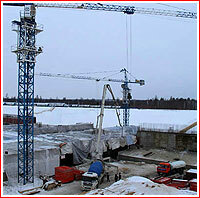 Pressed by Moscow, the construction crews would be given only one day off on January 1 to celebrate the New Year (instead of almost two weeks of Christmas breaks customary in Russia at the time), while the installation of equipment was ongoing in the heated interior of the facility. At the end of 2014 Roskosmos said that all documentation for the systems of the launch and processing complex had been issued, more than 90 percent of the equipment had been manufactured and around 70 percent of that hardware had been delivered to Vostochny. The agency promised to deliver the rest of equipment in the first quarter of 2015 based on the readiness of facilities intended to house it. 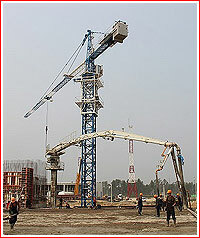 Workers also started the assembly of the mobile service tower, MBO, on the launch pad. 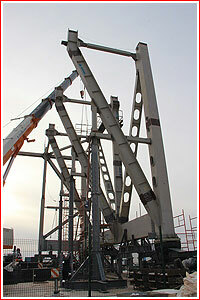 The first 18 meters of the nearly 50-meter structure were scheduled to be completed before the end of the year. 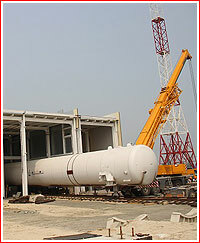 Along with most components of the launch complex, MBO was promised to be completed by June 2015. In December, Spetstroi also promised to keep a June 30, 2015, deadline for the completion of 12 apartment blocks, a bowler plant, a kindergarten, an administrative center and a supermarket at the residential area. 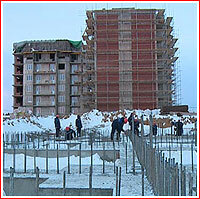 Around 10 kilometers of heating lines were also under construction. At the same time, a division of Spetstroi called Spetstroitekhnologii launched the construction of five new facilities in Vostochny, the official TASS news agency reported. They included a meteorological complex, communications site, drop zone operations complex, a second phase of the industrial and storage facility and the administration and business center. Spetsstroi quoted 8,667 people working in Vostochny in November and claimed that Vostochny would be 80 percent ready by the year end. 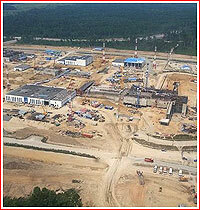 It promised to redirect 350 workers from other sites to Vostochny. However, as one reader's comment to the Kommersant article indicated the situation left the Far Eastern division of Spetsstroi between the rock and a hard place: "Moscow pressed Dalspetsstroi with this launch site really hard on both pricing and wages. They were forced to pull money from commercial projects leaving their subcontractors and employees without pay and funnel it into the launch site. The Kremlin wants this space site like Olympics, the annexation of Crimea and similar mega-projects. However there is no money for everything, so they started squeezing Dalspetsstroi and everybody else down the food chain." By the end of 2014, Russian officials still insisted that the the first phase of construction in Vostochny would be completed by mid 2015 and the first Soyuz rocket would be launched in December of the same year. In December, the Tyazhmash company tested the launch structure, informally known as Tuylpan (Tulip), which was designed to hold and release the Soyuz rocket during its liftoff from its future launch pad in Vostochny. The experiment was conducted at the company's specially outfitted test facility in the city of Syzran. After the test, the structure is expected to be taken apart and shipped to Vostochny for final assembly on the launch pad. Work inside the assembly building at the processing area of the launch center around September 2014. The Russian president Vladimir Putin reviews the construction of Vostochny from a helicopter on Sept. 2, 2014.